Eco Logical sunscreen, originally from Australia, is designed to be reef-safe, biodegradable, and gentle on the skin. While is is more expensive than other sunscreens, I put it to the test to see if it lived up to its claims and justifies the price. 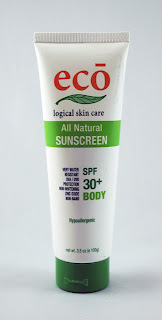 Eco Logical sunscreen has a great texture, which is a bit thicker than a typical day moisturizer. It absorbs quickly and is non-comedogenic (won't clog pores). I love how there is no sunscreen smell and it rates a low 1 on EWG's Skin Deep database. I would love to see a vegan version (without the beeswax). If you're looking for a nice everyday lotion for your body, Eco Logical offers a great option.